Lonely Shimpling parish straggles through the rolling hills between Lavenham and Hartest, and St George is a cosy Victorian restoration in the south of it. The setting is straight out of Trollope; you walk up a carriageway, an avenue of lime trees, and then across a bridge. On the far side of the church, you can approach via a bridleway. It is easy to imagine Septimus Harding and his son-in-law meeting here, the exasperated Archdeacon leaping down from his horse, in a scene from The Warden. The churchyard is rather unusual. To the south of the chancel is the bulky Hallifax mausoleum, looking for all the world like some kind of 19th century garage. Also to the south is a sweet little building generally referred to as the Faint House, and its use ascribed to ladies whose corsetry had overcome them during lengthy sermons. Probably, it was a school house provided by the Hallifax family of nearby Chadacre Hall. There are two Shimplings in East Anglia, this one and the one in Norfolk, miles away. And yet, they both have parish churches dedicated to St George, a relatively rare dedication in this part of England. It is likely that one or the other is a mistake by 18th Century antiquarians, whose work was then used when dedications were generally restored to parish churches in the middle years of the 19th century. 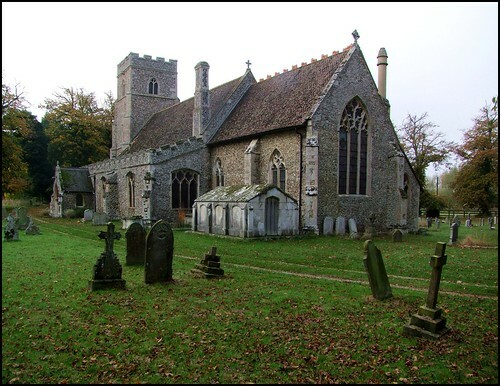 They had used documents from the archives of the Diocese of Norwich, and probably did not know which Shimpling was being referred to. I hadn't been to Shimpling for years. It had been one of the first churches I had visited for the Suffolk Churches site in 1998, in the days before I even carried a camera, and so it was more than ten years later that I returned, on a frosty day in late October 2009. We had walked from Hartest through the chilly mist of the Chadacre Estate, which was for many years an agricultural college. The carriageway up to the church was carpeted in the vivid red of fallen leaves, and the sense of isolation was intensified by the weather. The occasional squawk of a pheasant punctuated the stillness. But even on a gloomy day this is an attractive building, looking all of its 1860s restoration, although it seems that some of the window tracery is still medieval. We stepped into a deep gloom, and I had remembered this church for its darkness on my previous visit, all those years ago. But this darkness is a perfect setting for some lovely and interesting windows in the south aisle. The best depicts the Presentation in the Temple, Mary and Joseph standing before Simeon who holds the infant Christ. It is the earliest work in Suffolk by Henry Holiday, dating from 1864. After a moment, you might notice that Anna is missing, and in fact this was originally a three light window, set in the east end of the south aisle. It was moved when the Powells' Faith Hope and Charity sequence was installed in the 1880s, and it seems that the third light, depicting Anna, has been lost. Holiday's angels are still in situ above the Powells' figures. The east window is the earliest work of William Warrington in Suffolk; the presence of windows by Warrington and Holiday in the years before they came to national prominence is a testimony to the taste and money of the Hallifax family. Theirs too are the memorials, two of which are by Sir Richard Westmacott. The best is to Elizabeth Plampin, and shows her standing beside an urn. Perhaps less good is the memorial to Sir Thomas and Anna Halifax in the south aisle, which is an exact copy of Westmacott's memorial to Henry Villebois of three years earlier, at Marham in Norfolk. The two angels are rather clumsy and alarming, and Sam Mortlock felt moved to describe this monument as banal. A six-pointed star on the pulpit reminds us that it is set where the medieval chapel of the guild of the Holy Trinity was, and some Holy Trinity symbols are also set in the upper lights of the window here. This pleasingly atmospheric church had its day in the national eye in May 2002 when the temperamental supermodel Claudia Schiffer got married here. Schiffer lives at Coldham Hall, not far off in Stanningfield, and this church was chosen out of all the local churches for its isolation, possibly because Ms Schiffer and her husband-to-be wanted a quiet wedding, more likely because they had sold all the photography rights to Hello! magazine. Guests included Madonna, Brad Pitt, Boris Becker and Richard Curtis. The former footballer Vinnie Jones was an usher. One local told the reporter from the Daily Telegraph, disbelievingly, 'Nothing like this ever happens in Suffolk'. And standing here now, it does all seem a little unlikely.